In Paris at least! We’ve had a beautiful sunny autumn but every good thing has an end. However, I am happy for at least one reason: I am gonna have a real reason to wear my new plaid scarf. Cause yes, even though scarves are very stylish they are also useful. Regarding the choice of a scarf, my motto is mostly “the bigger the better”. Two pretty ladies, two grey scarves indeed. But the one left is way more stylish! Now you know why. 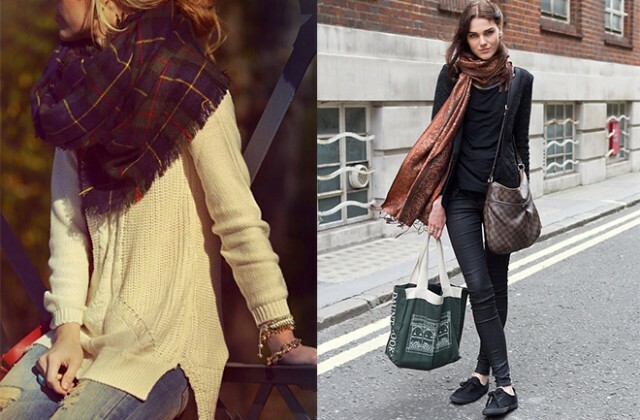 So you should always be able to tour your scarf at least once around your neck without tightening and still have the remaining bits hanging loose on both sides, till the waist. 2. HOW TO WEAR IT? 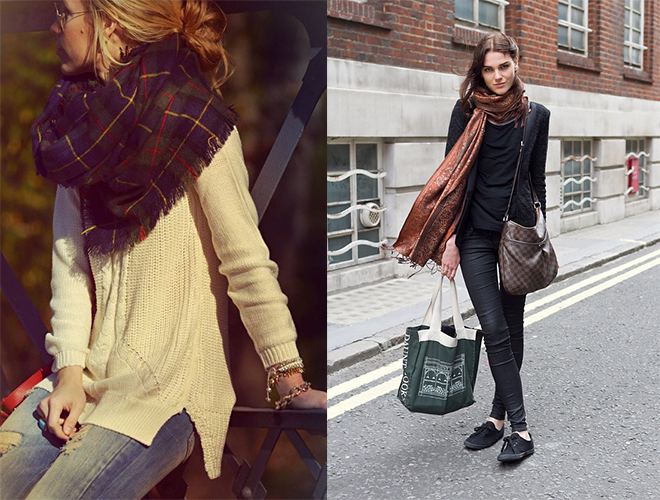 Either let the ends of the scarf loose on your chest or behind or tie the scarf around your neck. Not like them… From left to right: not wrapped (and too small), too tight, to thin (booooring and cooold). Once you got those first two step, you did more than half the way. Let’s go further with the choice of the fabric. Black or neutrals (beige, grey, white, brown) are always classy. The good thing is that you cannot go wrong with those: they pair with anything and still give that extra twist to you outfit. Go a bit crazier, by choosing bold colors: they’ll enlighten your face in the grey winter. 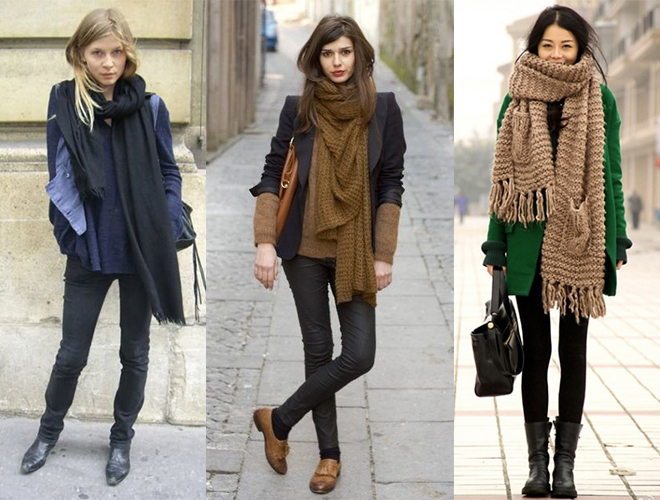 – go for neutral scarves if your coat is colorful. – or match it properly with a complementary color as red with green for example. But the game is risky. Scarves can be fun and you can have plenty of those. A winter coat very is expensive and a scarf, even a quality one, is way cheaper. By owning a bunch of them, you will feel like you have a different black coat everyday! And trust me, we parisian own a LOT! So when it comes to patterns you can be daring. 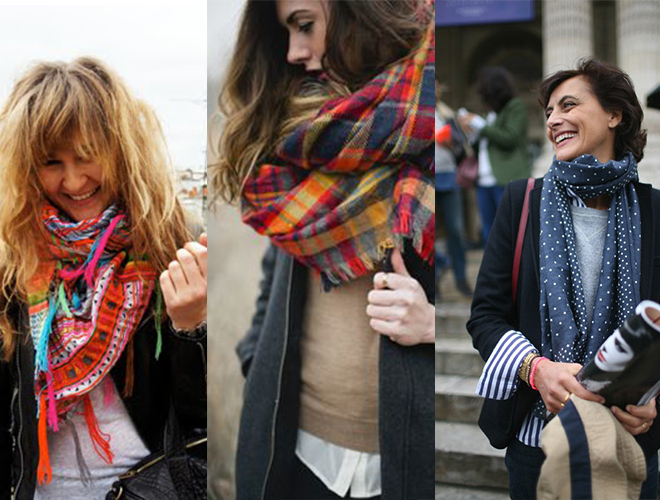 Just follow the same rules as for colorful scarves above and do not pair a pattern scarf with a pattern coat. 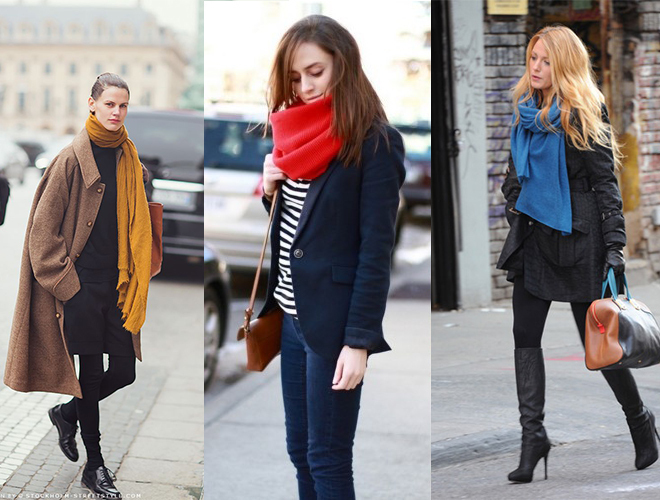 This article is about fall and winter scarves. I’ll do a new one for the summer because do you think we parisian women would take the risk to catch a cold in summer? If you have any questions, I’ll answer them in the comments. Great Post, very useful and informative blog. Thanks for sharing it. Bonjour, je suis dix-neuf ans, j’adore votre un site. Pardonne ma français. I was wondering if you can do a spring/summer article on long plain scarves with silk, pashmina, and chiffon materials? 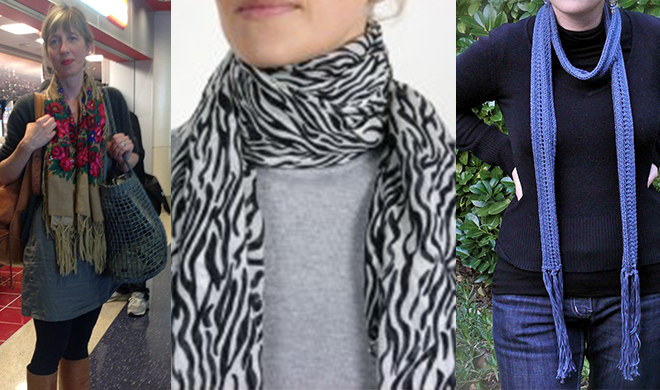 I prefer to wear gradients or scarves with only one color, but being introduced to non-flashy prints would be nice too. I am just unsure on how to match with my plain outfits, and still look well-dressed. 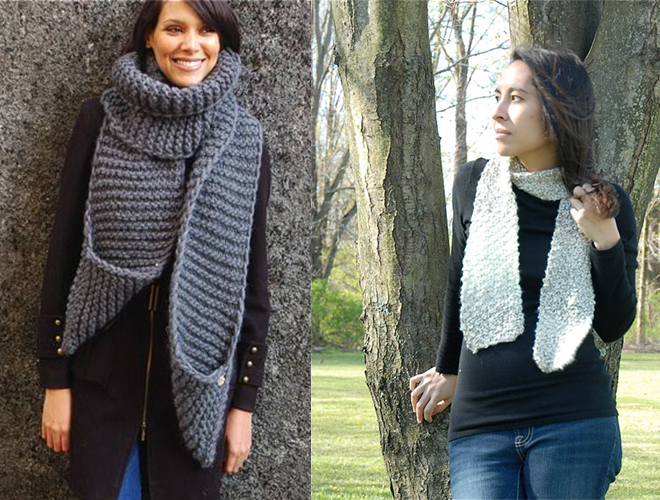 Have you heard of Inoui Toosh scarves? I saw them in BHV but wanted to research before buying. Do you have other suggestions on where to find quality scarves online that will ship to the Netherlands? Love this blog and wish I knew about it sooner. Maybe next time I am in Paris I can make an appointment! I just discovered this brand thanks to you and I love those scarves! The quality looks good. One of my favorite online shops is L’exception, I think they in Europe and have a great scarves selection. Hope I can do styling and shopping with you next time you visit Paris! Thanks, my flounciness link works well for me. Maybe it is because you do not have a pinterest account? Then just try google flouncy scarf to see what I mean. I absolutely adore your blog!! I just recently found it! I especially like that your fashion posts are so informative. I look forward to future posts! I’m so glad to have discovered your blog, it’s wonderful. I’m picking up so many tips and ideas! I’m so glad I found your blog! I look forward to all of your future posts. Paris is my most favourite place in the world and we try to go every year. I always admire french fashion. Greetings from Toronto, Canada! Thanks! Maybe see you in Paris next time! The link to the flouncy scarves you included above is hilarious! Your blog is a treasure! It has so many useful advice and presented in a very easy to understand manner. I love it! I love your blogs and I adore scarves! I will be in Paris for the holiday 29 dec to 5 jan. Perhaps we can grab coffee and chat fashion! Keep on writing, you’re doing a great job! Not sure I’ll be in Paris at this moment though. I write you a mail to keep you updated. I just discovered your blog a couple of days ago and I can’t stop reading it! You have so much useful information about fashion, I feel like I have learned so much already. Your articles are clear and well organized, I look forward to reading more.